2. Register a Cloud Service user account with an email address. 3. After logging on, input the device number and verification code on settings which are related to the monitoring devices. 4. You can log on Cloud Service on any computer which has been connected to Internet to browse the latest data in real time. For more information, please read the WatchfulEyE Cloud Service operational manual. www.wthny.com Surge/Lightning Protection Remote Intelligent Monitoring System---based on Cloud Service Platform of Internet of Things. 1. Internet of Things: each Cloud Service Networking device owns a unique device serial number and infinite node networking at the same time. 2. 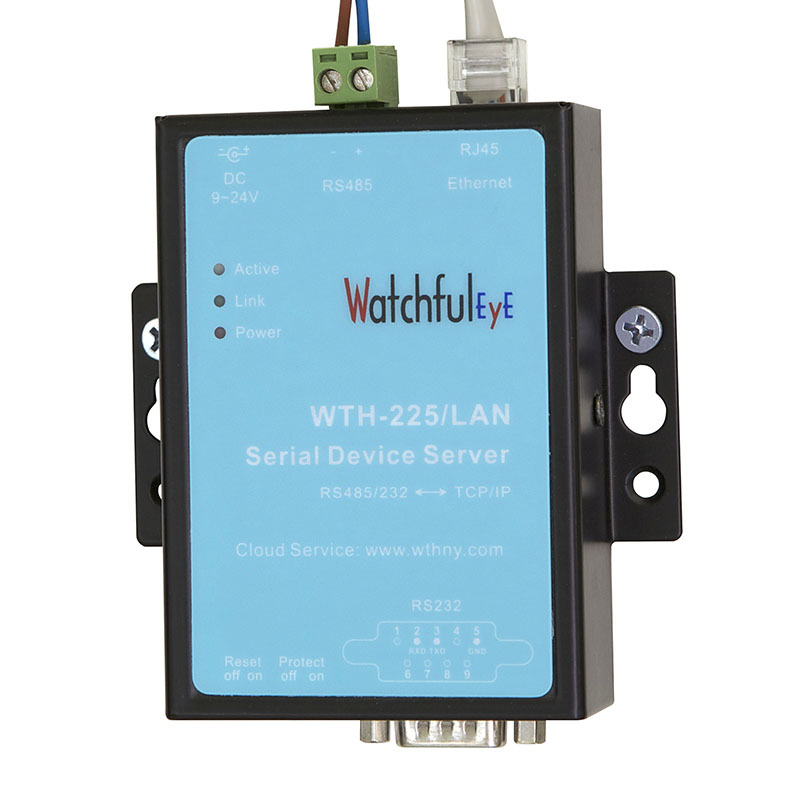 Cloud Connection: remote monitoring devices can be extended to RJ45 Networking by connecting with WTH-225/LAN with RS232/RS485, making the Cloud Management come true. 3. Unattended operation: log on the website www.wthny.com to browse the running condition of monitoring on-site surge protective devices (hereinafter called SPDs) on any computer which has been connected to Internet, making the telecommuting come true. 4. Real-time Data: log on Cloud Service to browse the real-time data at any time. Once an SPD fails or is broken by surge or lightning, the remote monitoring device will send out an audible and visual alert and meanwhile the Cloud Service displays the changes of running status of surge protection system. Then the maintenance staff shall go for a trouble shoot to prevent the risk of the following lightning strikes or surge. 5. Cloud Storage: all the data can be saved in Cloud Server, free for one month. 2. Alert sending: set an E-mail address for receiving alerts. Once an SPD fails or is broken by surge or lightning, the remote monitoring device will send out an audible and visual alert and meanwhile the Cloud Service will send the alerts to the E-mail address. Then the maintenance staff can receive the alarm alerts in timely and go for a trouble shoot to prevent the risk of the following lightning strikes or surge. 3. Setting the Longitude and Latitude data of the Remote Monitoring Devices. It’s clearer to browse the map directions of SPDs when centralizing management. 4. Log on the Cloud Service to browse the data of the latest 6 months on any computer which has been connected to Internet. It can be set up to save more information of longer prior periods for some important monitoring sites, which can be used as “a black box”. 5. The Cloud platform can realize the multi-user hierarchical centralized management.